Fertilizing Potatoes - Do They Need It?? Yes, fertilizing potatoes 2 weeks after planting them in your garden is generally a good idea. It gives them the energy they need to grow large, well developed spuds. Choose a fertilizer with potassium and phosphate levels that are higher than nitrogen levels. Pay attention to the 3 number code on the bag of fertilizer. These three numbers indicate the amount of nitrogen, phosphate and potassium that are contained in that particular fertilizer, respectively. For instance, a 10-10-10 fertilizer contains 10% nitrogen, 10% phosphate and 10% potassium. A 5-10-10 bag would contain 5% nitrogen, 10% phosphate and 10% potassium. Nitrogen encourages a plant to produce more foliage. Phosphate and potassium encourages more root development. Because potatoes are a root vegetable that grows below the surface of the soil, phosphate and potassium are more beneficial to potato growth. Choose an all purpose granular fertilizer with the appropriate levels of potassium and phosphate, usually 5-10-10 or 8-24-24. Scatter the granules on the ground around the plants and water them in well. Follow the manufacturer's directions for the amount of fertilizer to use. It is generally applied at a rate of 1 1/2 pounds per 100 square feet. Be sure not to allow the fertilizer to come in contact with the plant, as it may burn or have other adverse consequences. You can also use a water-soluble fertilizer and apply it once a month when you water. A hose-end sprayer is often useful for this and the fertilizer should be mixed according to the manufacturer's instructions. Again, look for something that has more phosphate and potassium and less nitrogen. 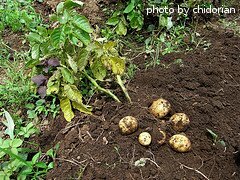 Begin fertilizing potatoes 2 weeks after planting. Continue to apply fertilizer every 4 weeks. Stop fertilizing 2 weeks before harvest. Fertilizer needs to be watered in well to work properly. As you will not be watering your potato plants during the last 2 weeks before they are harvested, there is no need to fertilize. 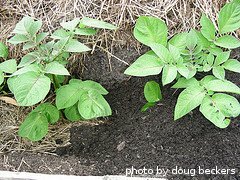 If you wish to grow potatoes organically, mix some compost and/or well-rotted manure into the soil before planting. You can also add bone meal, wood ashes and seaweed to add additional nutrients during the growing season. In addition, you can use a compost mix when you are mounding soil over the plants. 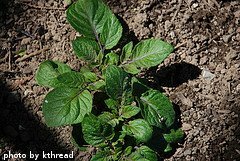 Click on the following links to learn more about watering, mulching and harvesting your potatoes.